How the icons are placed and chosen? So I am asking if anyone knows how these icons are selected. Matt Cutt’s only advice was make sure your listing is claimed in Google places, other then that he didn’t have any suggestions. He said he would find out. Hopefully he gets back to me. Let the Local Service Area Tournament Begin! New to your LBL as of TODAY: Service Areas and Location Settings! WOW!!!!! YEAH!!!! SWEEEEEEEEEEEEEEEEEEEEEEET!!! … it’s about TIME! Every chance I had to communicate with someone from google maps I squeaked the wheel of, “so when are you going to offer service areas?” Annoying? Yes. But necessary. ….So Thanks for listening. Restaurants, shopping centers, UPS stores, all have customers that go to them. Pest control companies, plumbers, pool guys, all go the their customers. That is the perfect qualifier or whether or not you should be in a service area class or a location class. Minus the fact that some restaurants will offer both delivery and sit down. But do you want to be a delivery company or a dine in. Your call. For my business this new classification is wonderful. Bravo, google. So how is this going to work? How are they going to determine who is best fit in the service area? I would assume that traffic to the businesses website will play a factor. 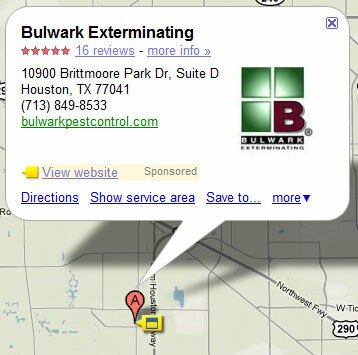 Searches on that business by IP address will play a factor. And yes, I imagine that your location will still play a factor. Especially when all else is equal. The good news for Google is that all of the SEO experts out there will stop telling companies to spam the maps with fake addresses to be considered local. The bad news for local smaller companies will be that they are once again put on a platform where they are competing in a division A game, not in a location driven division C game. The good news for the users is that hopefully the users will get more qualified choices instead of Pop Shop’s ABC. And as Google sees it, the happier the users are with their experience the better off Google will be. Plus this puts Google in a whole new realm of Local Business. Yahoo doesn’t offer this and their maps are littered with bad information even after offering a “featured/paid listing”. Bing doesn’t offer this. Google is King of the internet local world. I can’t wait to see when Google offers their own mobile-map-app that allows rating and check-in. I have no doubt that they will be buying one soon or creating one of their own soon enough. QR-Codes -Hidden Information? Unique Codes per Generator? If the language is the same, and the text link is the same then why are the QR-Codes Different? I am convinced that QR-Codes are passing on more information than you realize. While some may say that it is simply a generator difference, I am not convinced. Each QR-Code is readable by quickmark, and apparently contains the exact same URL. But when generating a new QR-Code from existing QR- codes the offspring is unique. So the only conclusion we do have is that the generators are marking the code by who generated it, and subsequently the quickmark generator is passing on something from the first generator. …So far the time stamp theory has proven negative. Images of QR-Codes and the subsequent matings of QR-Code Generators. The text link generated by this QR-Code is : http://google.com/m/place?georestrict=input_srcid%3A6a8383041e7e4ce8 according to QuickMark (Big mama). Quickmark then provides an option to re-create this QR-Code…. Yes… they are different… but they carry the same url. So Big Daddy and Big Momma are produced a new baby. No surprise at this point but this is….. Different. Different… yet the same text/link…? Time stamp???? No. Here is recreation 2 of big daddy and big momma 30 minutes apart. Twin delivered 30 minutes later. While the intended information is the same, link/text, the QR-Codes are clearly different based on how they are generated. It seems to me that they must be passing on additional information. To what end or what information I cannot say. I am not going to accuse quickmark as being the mother of all whores or Google as being the anti-christ. Although it is amusing that if this were true.. quick “Mark” could easily be the “Mark of the Beast” if google, which is a number, is indeed the “Beast”. How many zeros in a google??? Was that 666??? Just kidding! Can someone give me a viable explanation as to why these QR-Codes are different? What information is being passed on? Post to your Place in Google Maps! So google wants to be updated? Whatever for…??? This new feature is going to force… umm… allow you to be more interactive with google and your customers. Absolutely a great tool for local restaurants, clubs, and such. Still a good tool for services, as you can run promotions and events here. What google is asking for is interaction. What they want is your time… and time is money. Great tool to add to your onslaught of Google Maps. Here is a glimpse of the the before and after Google maps recent service area changes. So this is a shot of my trend… what happened? So now they are back to only listing businesses addressed in the city searched… a search for Austin pest control shows only locations within the city of Austin…. urghh. I mean I love it in Austin, as we rank #3 but I am not about to buy up property within every city limit to land in the maps. The Awkward Google Map Dance Continues…. So the mixed messages…. Left… Right… Left… the Awkward Google Dance Continues. Google maps or should I say SUPERMAP! It’s a road, it’s a house, it’s a business its… SUPERMAP! Yes all this and more can be found on google maps, and now they are moving into a top position as the “Directory of choice” or “the Only Directory”. I am not sure if I should be chanting the SuperMap praise or not. They are quickly becoming… well invincible. What is Google’s Kryptonite?… oh, that would be all the errors they are still working to fix, like their local maps still not showing correct information after all of the database cleaning and merging. And things like their Charlotte NC maps not listing their filtered “by user reviews” properly. But with so many greedy villains out there who can Google trust? And if I were Superman then would I even care to trust anyone else? I mean look at what happened between Clark and Lex? Yep, the Supermap does come with some baggage. But I think Supermap is a hero. I mean… look at all the corruption it is killing off. Old dinosaurs that still boast themselves as relevant phone directories just so they can steal money from the innocent and naive while creating huge amount of trash. How many landfills do those books fill up each year? Go Supermaps Go! This is a cropped screen shot of the reviews section of a local business listing in google. What is google maps doing now? Are they trying to hide the reviews? Please help me understand! I have always found it helpful to click on the users to see what other reviews they have and to make sure they are legit. I trust reviewers that have more than one review and that have both a mix of good reviews and bad reviews… from what I understand google is moving that direction as well. I believe they are attempting to identify “Super Reviewers” or as they would put it “Trusted Reviewers”. According to Matt Cutts google is all about determining who they can trust…. and for good reason. But what about your useres that want to see the math worked out… Why hide the reviews?